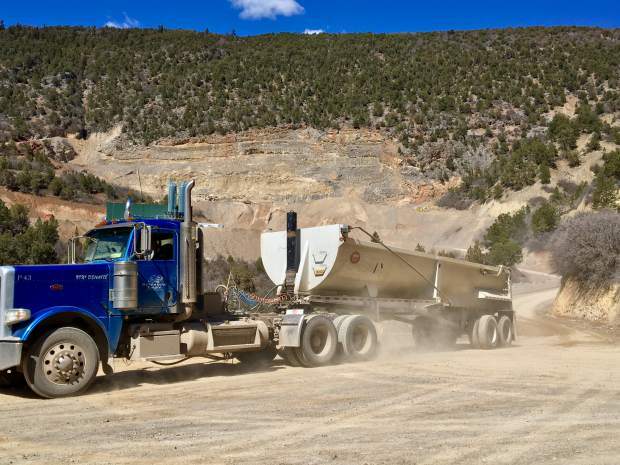 A truck leaves the Rocky Mountain Resources limestone quarry on lower Transfer Trail north of Glenwood Springs, on the back side of Iron Mountain, on Tuesday. Plans are in the works for a major expansion at the quarry. The Glenwood Springs Chamber Resort Association board of directors is raising serious questions about an issue many Glenwood residents believe would kill tourism-related business in town. “Based on the information currently known, the potential magnitude and irreparable nature of adverse impacts to the city of Glenwood Springs and its economy, the GSCRA believes the expansion merits further inquiry and examination,” according to a statement issued by the chamber on Tuesday. While numerous residents have already expressed their own concerns about Rocky Mountain Resources’ increase in production of the quarry, the Bureau of Land Management and city officials have reserved comment about the project pending a formal application from the company to expand the quarry. “The City Council and city staff is looking closely at whatever proposals Rocky Mountain Resources make and we will respond at the appropriate time,” Glenwood Springs Mayor Michael Gamba said in a previous interview. Wagner did not return a call for comment on the chamber’s position. According to information shared with residents in the Oasis Creek neighborhood just below the quarry site on Transfer Trail, RMR has its sights on increasing the size and scale of its operations from roughly 13 acres to 260-300 acres, and from 20 dump truck loads a day to 250-350 daily. Similar information was shared with the chamber board and other private and government entities ahead of the formal BLM submittal. While the GSCRA does not have any legal authority in the matter, the board is urging the BLM, and any other permitting agency, to demand the highest level of scrutiny for the forthcoming application from RMR. That should include requiring a full Environmental Impact Statement (EIS) under the National Environmental Policy Act, “to ensure that the expansion is in the best interests of the citizens of Glenwood Springs, its tourism-based economy and to the surrounding communities,” according to the Chamber board’s statement. Once an application is submitted, the BLM will open a 30-day comment period before deciding what level of review to give the proposal. That could involve a full EIS, or the less-rigorous Environmental Assessment.